FBI agents seized smashed computer hard drives from the home of Florida Democratic Rep. Debbie Wasserman Schultz’s information technology administrator, according to two sources with knowledge of the investigation. Pakistani-born Imran Awan, longtime right-hand IT aide to the former Democratic National Committee chairwoman, has since desperately tried to get the hard drives back, an individual whom FBI investigators interviewed in the case told The Daily Caller News Foundation’s Investigative Group. Imran’s younger brothers, Abid and Jamal; his wife, Hina Alvi; and Rao Abbas, Imran’s best friend, are also under investigation. There have been no arrests in the case. Soon after Imran began working for Wasserman Schultz in 2005, his two brothers and two of their wives—plus Abbas and another friend—began appearing as IT staffers on the payrolls of other House Democrats. Collectively, the Awan group has been paid $4 million since 2009. 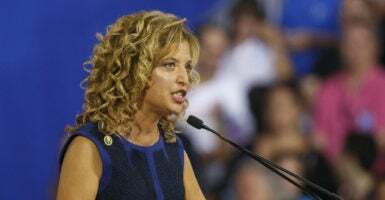 Fellow IT staffers said the Awans were often absent from weekly meetings and email exchanges. One of the fellow staffers said some of the computers the Awans managed were being used to transfer data to an off-site server. Shortly after the criminal probe was revealed in February, Imran abruptly moved out of his longtime home on Hawkshead Drive in Lorton, Virginia, and listed it for rent on a website that connects landlords with military families. “When we first moved in, a mailman came with certified mail from the House of Representatives. We were trying to be nice and signed for it. They lost their s—, saying, ‘Why did you sign for it, this is illegal!’ It was certified from the [chief administrative officer of the House],” he said. Imran’s brother Abid has also been evasive about his location, failing to provide an accurate address for delivery of court materials in a lawsuit in which he is accused of defrauding the brothers’ stepmother. Imran’s wife has traveled to Pakistan since the probe was revealed, according to neighbors. Wasserman Schultz has demanded the return of a laptop seized by the Capitol Police because it was purportedly used by Imran and was found hidden in a vacant office. The Florida Democrat used a Capitol Police budget hearing to threaten “consequences” for them if the laptop wasn’t returned. On Thursday, it was reported that police have not examined its contents because of the invocation of the Constitution’s “Speech and Debate Clause,” and after months of refusal, her lawyer is now “negotiating” access to the data on yet-to-be-determined terms.